This saree from the house of De Marca will make a fine addition to your ethnic wear collection. It comes with an embroidered pattern that elevates its beauteous appeal. Crafted from georgette fabric that lends an impeccable look when draped. 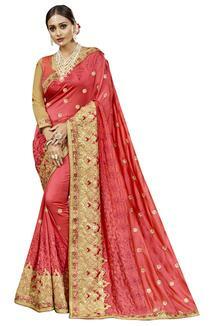 Flaunt some style wearing this saree to any wedding occasion. Team it with a pair of heels and matching earrings for a perfect look.